Welcome to a privileged world where hidden motives abound, everyone has something to sell, and safe havens don’t exist. With her older sister Mary, a pathetic example of a royal has-been, Anne schemes to marry her beloved Henry and even more challenging, stay married to this man who has more options than most and less guilt than is good for either of them. Success will mean contending with backstabbing “friends,” Henry’s furious ex-wife, and the machinations of her own ambitious family, and staying married to a man who has more options than most and less guilt than is good for either of them will take all her skill. Anne will do anything to hold on to the man—and the lifestyle—she adores, however, even if sticking your neck out in Hollywood means risking far worse than a broken heart. With Henry’s closest confidante scheming against her, and another beautiful contender waiting in the wings, Anne is fighting for her life. Can she muster the charm and wit to pull off her very own Hollywood ending? 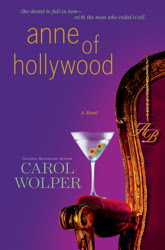 Anne of Hollywood may not be for everyone but I thoroughly enjoyed it. Let me first say that I am not an expert on the life of Anne Boleyn (although according to my mother I was picking out portraits of Henry VIII in stately homes across England at the age of two!) but I know a little bit about the time period and the story between the king and his second wife- I did several projects in grade school and read a lot of books even before the popularity of the period really came about with the television series The Tudors. I thought that Wolper did a good job of getting the story and characters out into a new time period without straying too far from the original relationships which was certainly a tricky task. I was a bit confused about a couple of things so I did do some digging for example about Theresa Cromwell’s character who was the only one I thought veered off somewhat from her base of Thomas Cromwell. I found Theresa’s role as advisor to the “king” authentic but her personality didn’t really fit with Thomas’. Theresa was certainly interesting but I was a bit confused about her desire to be with Henry herself- certainly not something we know about Thomas Cromwell- however there of course has to be some fiction allowed! The most difficult part about creating an alternate universe for historical characters is getting a perfect balance of real and fiction. You don’t want to offend the experts but also want to keep enthralled those who only know a little. For me the balance was there and very well executed but having finished the novel I wonder if there would be an appeal for someone who knew nothing about the period. I fear that the novel would be a bit unreachable and even strange if you didn’t know a thing about Anne Boleyn of history- that the characters would not be so reachable. I only have one true complaint and that was Wolper was occasionally a bit vulgar with the language which turned me off at the beginning. That’s perhaps just me being a prude and all in all I finished Anne of Hollywood very impressed and wondering who I could recommend it to next.